Visit the integration overview page within the SendCloud panel and click on the add button next to the eBay importer. 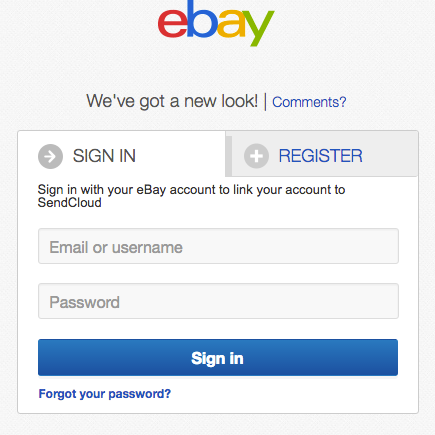 This will redirect you to your eBay shop, where you are first prompted with the login screen. After login you are asked to agree on a connection with SendCloud. After you agree, you are redirected back to SendCloud. The overview now shows the most recent orders in your eBay shop. On the eBay settings page you change some basic settings as shown below. Shop feedback allows you to configure the moment when the feedback is send, weight can be imported from the orders to improve selection of shipping methods.